Notes: This is not your typical vodka be a long shot. Not only made in stunningly small batches by using honey, water and yeast only (it requires 3 pounds (1.3 kilos) of honey to produce 750ML bottle of 80 proof vodka) to prepare a 40 gallon wash (batch) which is cld fermented and distilled into quart (roughly a liter) sized cuts. They use their own raw honey from the farm and the honey from only one other bee keeper in their area (Northern Minnesota) and distill the vodka in a 10 cap, bubble cap column still ( that is mostly stainless still and electrically heated as far as we can tell). Cold fermentation is a slower process than what many distillers use but its can yield a much cleaner product that does not need to be filtered to remove a lot of nasty by products from a hot or fast fermentation. The honey itself is a wildflower honey and is raw ( not heated,filtered, or processed prior to fermentation in any way preserving the flavor and integrity. They could produce five bottles of honey mead for every bottle of honey vodka they produce instead, due to their merciless attention to quality by making strict cuts and only using the very heart of a already small distillation. They distill the vodka only once to preserve the quality and characteristics of the honey rather than file it to death like so many others. If you distill correctly the first time you don’t need to keep distilling a product if you want to keep the characteristics and subtleties. Unlike many other honey vodkas, this one is not sweetened or flavored after the fact with either honey or mead to change the flavor or boost the honey profile also. Another important point is they use water from a natural artesian well – not some Reverse Osmosis /Fear of Flavor soulless water (try drinking a glass of distilled water to get my point). Every bottle is filled and bottled by hand. Appearance: Crystal clear with a wonderful viscosity.On swirling it leaves a light coat on the glass with very small droplets forming after an interval. First Impression: Delicate floral and honey notes with a pleasing backbone of alcohol and minerals very much in the background. faultless with no heads or tails in the mix, just a pure heart of the distillation which retains the delicate characteristics of the honey. Taste: Smooth as glass with a slightly viscous,splice entry with just a touch of sweetness, rapidly but pleasantly progressing to a drying warmth with a good underpinning of minerality that braces on the tongue and leaves a slightly floral and mineral long fade. Extremely smooth and pleasant. Drinks: To really appreciate the artistry and deftness of this vodka it really should be enjoyed at room temperature on its own in a decent tasting glass so you can fully appreciate the art and effort. You can however also mix this vodka with some outstanding results you chose to do so. There are many creative and inventive recipes on their website that highlight their vodka and its characteristics nicely. Bottle: Tall clear glass, square and slightly flared at the top with rounded , down curving edges at the top.Picture an antique gin bottle stretched out and you get the idea.Label is a full panel plastic appliqué that is semi transparent with a honeycomb graphic/artwork/theme to it.Back label is clear appliqué with some of their story on it. Both labels are easy to remove so you can repurpose/recycle the bottle afterwards. Clear unadorned neck wrap surrounds the synthetic cork with a ridged topper. Synthetic cork seals better and does not run risk of flavoring the vodka (Sorry cork purists !). Heavy decanter still bottom conveys sense of sumptuousness and helps balance bottle. Neck is good length for most people to grip easily. Overall a distinctive package that can be spotted at a distance on a bar or liquor store shelf. Other: Natural, Gluten free, real water, distilled once. All important points ! 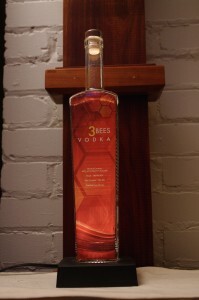 Final Thoughts: There are damn few vodkas made from honey. I think there are so few that they could be numbered on the fingers of both hands. Grain vodkas however, you could have everyone at a rock concert hold up their hands and that might be enough to count out the brands.This honey vodka is outstanding, and while expensive, unlike Avian Fashion Victim Vodka and many other supposedly “Premium” or “Super Premium ” Vodkas theirs stands apart in quality and materials from the sea of other vodkas. Honey is an expensive, difficult, and fragile product to use in distillation requiring skill, dedication, and maybe a touch of madness to produce. A nicely done, attractive and easy to navigate site. Includes some background, recipes and links and addresses of place to but the vodka. More up to date than the website, They mention a gin not found on the web page among other things.